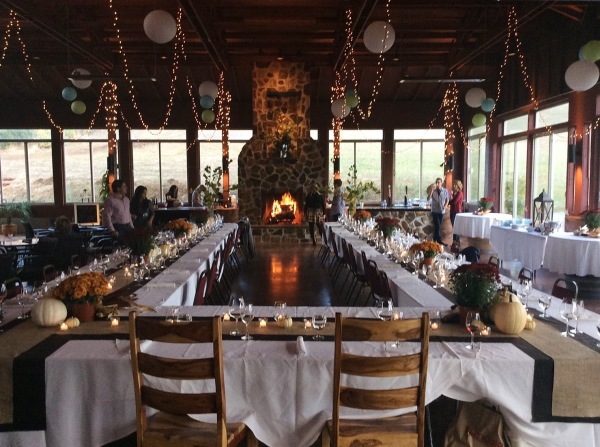 Located in the stunning South Willamette Valley wine country, we invite you to host your next event at Pfeiffer Winery. We cater to birthdays, anniversaries, bridal showers, executive dinners or retreats. At the heart of every event is a love for good wine! Our on-site Events Manager is here to assist in custom tailoring your event from start to finish. Located just 20 minutes from Eugene, can accomodate small parties or large groups up to 125 people in one of the various indoor or outdoor spaces. The rental fee includes the use of the designated event space, various styles of tables (60" round tables, wicker cafe tables, beautiful glass top barrel tables, 8', 6' and 4' rectangle tables), chairs, service staff, Riedel crystal glassware, PA sound system, 2 large screen televisions for presentations or even karaoke! We customize a package based on your needs. Depending on the size of your group, there is an hourly rental fee, a minimum wine purchase, and an 20% service charge applied. We would love to meet you, have you tour the venue, taste the wines, and discuss any questions you may have. We are currently unable to host wedding ceremonies. If you are interested in hosting the ceremony off-site and would like to plan your reception here at Pfeiffer Winery, please feel free to contact us at the number above. Thank you. Please use the form below to reserve a private event, or rent out the entire Grand Fireplace Pavilion at Pfeiffer Winery. If you have questions, review the most frequently asked questions below, and reach out to our General Manager, Vanessa Sitowski (wineclub@pfeifferwinery.com) with any additional questions. We look forward to hearing from you! Do I need reservations to taste? If you have a group of 8 or more, please make reservations a week in advance. Additional staff members will be brought in to exclusively host your group. Please allow at least 1 hour for your tasting experience ~ After an approximately 40 minute seated wine presentation, feel free to wander the grounds and make your wine purchases. We are an educational winery, and we want to provide a memorable experience for you! Please Note: One person will be responsible for paying the tasting fees before the tasting begins. Please handle reimbursements personally. Do you charge a rental fee for your space? We do charge a flat $300 venue rental fee for your event - this covers a 3 hour time period. If you need additional time, we can absolutely discuss the pricing. You are allowed to arrive 1 hour before the event to decorate and are allowed 1 hour after your event to return the space to the pre-event condition. We also have wine purchase minimums that need to be met. Our wine minimum is dependent on the size of your party. If you do not meet the minimum during the event, additional bottles of wine will need to be purchased and packaged up to take home to meet the minimum requirement. Do you charge a bartender fee? Is gratuity included? Depending on the size of your group we will have 1- 5 employees pouring wine. A 20% gratuity is added to your contract. Do I have to rent out the entire space or may I just rent a portion of the Grand Fireplace Pavilion? If your group consists of 50 or fewer people you can choose to rent out only a portion of the Grand Fireplace Pavilion. Groups over 50 are required to rent the entire space. Our space can accommodate up to 125 people comfortably inside the Grand Fireplace Pavilion. We sure do! We’d be happy to share our favorite caterers, musicians, photographers and party supply rental companies with you. Although these vendors are preferred you are more than welcome to choose others. May I bring in outside alcohol? No. If you’d like a specific beer we can do our best to order it in for you. Pfeiffer Winery must facilitate the sale of all wine and beer. Absolutely no hard alcohol is allowed to be consumed on our property per the OLCC. What hours may I host an event in your space? We are happy to work with you and determine an event timeline on a case by case basis.